After five years of formal investigation, the European Commission announced today that it has sent a Statement of Objections to Google concerning its means of promoting Google Shopping results. The allegation derives from Google’s giant footprint in general online search, boasting a more than 90% market share. By using this position to systemically favor its own comparison shopping service, Google, says the Commission, may be in violation of Article 102 of the Treaty on the Functioning of the European Union. This Article prohibits the abuse of a dominant position. At the same time as its shopping-related announcement, the Commission notified Google that it had opened a formal investigation into the Android mobile operating system. Shopping results are just one of a suite of Google services which have been scrutinized over the course of the last five years. Others include local search, in which Google competes with services like Yelp and UrbanSpoon, and Maps, which Google has slowly taken over throughout the past ten years. Though the Commission has only issued objections for shopping, it is safe to assume that those other avenues are not yet entirely closed off. The Commission’s approach strikes an odd balance between the current engines of innovation in the products it hopes to regulate – namely, Google platforms – and potential engines of innovation and choice in these large online markets. By limiting the former, the Commission advances an uncertain future balance at the risk of chilling product innovation among monopolists like Google. This is a counter-productive result. In its fact sheet, the Commission details its preliminary conclusions about Google’s conduct. During the course of the investigation, the Commission’s position may change, as preliminary conclusions do not prejudge the outcome. The conclusions and the wording with which they are presented underscore the deep philosophical difference of opinion between the regulator and regulated. The Commission sees Google as a sleeping bear. Google sees itself as an imperiled start-up. This first allegation is an attempt to foreclose the grey area between product design and exclusionary conduct. 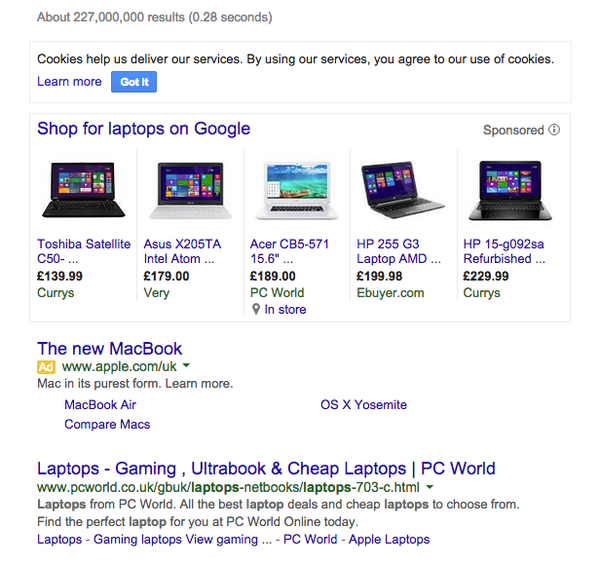 When a user searches for a product on Search, Google displays a series of results from its own service as well as others. On a dominant platform such as Google’s general web search, the slightest change in product design can mean a huge volume of traffic being directed towards an intended target. Though they have worked in concert on solutions for the perceived issue, the Commission alleges that Google’s redesign has not gone far enough to correct for its self-promotion in shopping results. Along with the conclusion about the results being displayed “irrespective of merits,” this second allegation most likely reflects a behind-the-scenes knowledge of the relevant search algorithm. Google has reluctantly revealed the operating mechanism for these results as part of its ongoing cooperation with the investigation. The Commission in this case suggests that other results are subject to different rules than Google’s own results. Another way of stating this is that Google’s shopping results are automatically optimized, while other sites must fulfill certain conditions in order to appear consistently in web searches. As an initial matter, the information here is false. Froogle did benefit from promotion, and appeared as a link on the Google search page (where today you might see “Images” or “Maps”) for more than two years. This seems like a more direct means of promotion than the ordering of search results, but it is possible that the Commission is only referring here to the more subliminal effects. From a competition perspective, that intuition is unclear and could stand to be further elaborated by the Commission. This allegation also seems to suggest that self-promotion has been a critical step to success for Google Shopping. There is no way of knowing for sure, but it could well be that Google’s shopping-related search promotion represents only a small part of the success story. It is worth exploring the Froogle comparison a bit more to flesh this out. Products fail. A product by any name, especially one as goofy as “Froogle,” is subject to fierce competition, or worse, apathy. 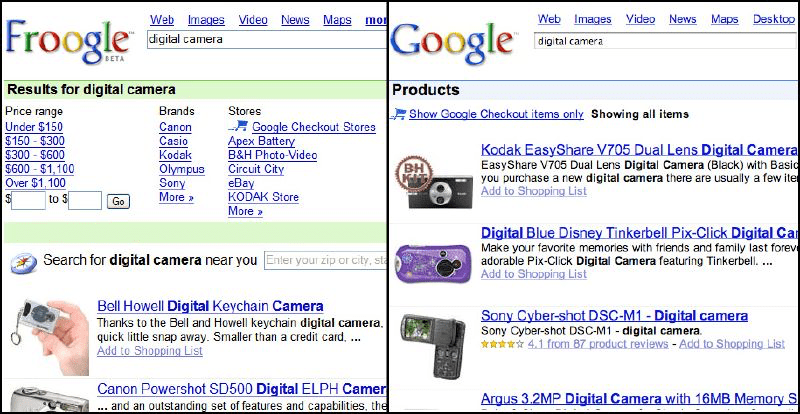 Google converted Froogle into Google Product Search, and later into Google Shopping. Like many Google products, it evolved over time. The Commission may have the data to support the causal link here identified, but until the public sees it, it remains to be seen why the name change would be any less significant than the post-search promotion, especially given that early products were linked to on Google.com. This allegation includes a causal link. This again is hardly falsifiable, but is at least more plausible than the implication in the Commission’s third conclusion. It stands to reason that promotion would have some positive impact on product growth. It is not, however, clear how the Commission has measured the magnitude of that impact. How much of a boost is needed to constitute an abuse of the dominant position? Is it relative to other products? As Google points out, many of its competitors in post-search comparison disputes have prospered alongside it. Is it fair to mandate that Google try not to limit the growth of competitors? What about Facebook? Amazon? Or a company like Yelp, which has grown by 350% in the last four years? By including the growth of products in the allegation itself, the Commission highlights the core tension here between competition regulation and innovation even within dominant companies. Google likely would not have entered this field if it knew that success would be used against it. Would the Commission prefer that result? This preliminary conclusion considers a behemoth like Google in the abstract. The hypothetical dominant firm would face fewer incentives to innovate as a result of this conduct. Google cries from the halls of in-house competition counsel, a glass cage of emotion facing Parc Leopold, that it cannot afford to rest on its laurels. Its Senior VP of Search pleads with the world to open its eyes – Google is good! Google is virtue! Google is imperiled! Let the consumer decide! The reality lies somewhere in the middle. Google is not your typical monopolist, because it takes a real pride in its consumer-friendly offerings. It is more like Amazon, in that sense. Observing Google and Amazon in their post-dominant behavior, they do innovate at a pace typically reserved for start-ups, rolling out new products like seasonal patterns. This could be a result of the pressure they surround themselves with in Silicon Valley, witnessing everyday the Icarian downfall of tech giants and the meteoric rise of small-change, neonatal firms. For now, yes, Google is an innovator. But as the dominant position consolidates across product lines, their behavior might drift further towards conventional monopoly. If it were to interfere further at this stage, the Commission would be wagering that the marginal utility of an innovating monopolist would soon drop off. It could also, however, hinder the innovation it aims to protect in the long run. For Google’s counsel, the latter claim brings up the specter of Microsoft’s infamous battle with DG Comp over its Windows Media Player tie. Google, for its part, has already issued a public defense of Android’s role as a mother to choice and innovation. Though this case is nascent, and likely to develop over years as the result of its complexity, Google likely views this investigation as another setback for its efforts to do business in Europe. The Commission’s five-plus-year investigation into the greyish-white fineries of competition law is particularly damaging given its context. This animated shouting, coupled with legitimate concerns over Google’s privacy record, has truly epitomized the “politicization of a regulatory issue.” The EU’s froth over Google and fixation on its dominance is an unhealthy distraction from the changes needed to bring Europe out of crisis. To mire a leading innovator in regulatory paperwork does not quite fit that bill. Antitrust: Commission sends Statement of Objections to Google on Comparison Shopping Service, European Commission Fact Sheet, Apr. 15, 2015, available at http://europa.eu/rapid/press-release_MEMO-15-4781_en.htm. Though there is still a search input on google.com, most links have disappeared until after search for those users with a login.